As we have seen, Carl Schmitt saw the mystical life as a direct parallel to the aesthetic life. As a kind of “natural religion,” artistic creation demands “virtue.” “Art is natural religion and its ‘mysticism,’ while paralleling true mysticism, is natural and created.” As with the religious mystic, the “natural mystic” must cultivate in his own way what Schmitt called the “mystical virtues” of temperance, poverty of spirit, and meekness—also referred to as purity, poverty, and humility—if he is to realize his full creative potential. St. Paul the Hermit (Purity and Poverty), oil on canvas,1922, 25 x 30 in. Purity, Poverty, and Humility are a triad of virtues with deep roots in the mystical tradition. They are the basis of the “evangelical counsels” of Poverty, Chastity, and Obedience, most familiar to us as the vows of monastic life. They in turn counter the vices of avarice, lust, and pride—the principal temptations of the world, flesh, and the devil as given in Scripture. Schmitt sometimes called these by more contemporary names: pleasure, money, and power; Comfort, Wealth, and Success. Nevertheless, these virtues are not divorced from the aesthetic life; indeed, they are essential to it. Schmitt saw “humility, poverty, and purity” as directly linked with “form, space and quality,” these last three delineating the dramatic, epic, and lyric stages of the imagination, respectively. From seeing merely the appearances or the “quality” of things (the lyric stage), the artist must move on to beholding them in “space” (the epic), all the way to the perception of their full reality, their “form” (the dramatic vision). Untitled, pastel on paper, 14 x 16 in. The artist, however, cannot avoid grappling with what Schmitt called “status”: his relation to the world and its standards—security, influence, fame— which can be boiled down to one thing: money. In the present world Schmitt saw the pursuit of money (and all that goes with it) as the greatest threat to the integrity of the artist. It was not a matter of the artist chasing after celebrity or a life of luxury, nor of living “in poverty” with no means at his disposal. As Schmitt put it simply: “artists are often heard to say that they will do pot-boilers until they have accumulated sufficient money to enable them to paint ‘as they want to.’ Well, they never do.” The artist must choose first to paint as he wants to—to “paint as he loves, as he knows, as he understands, as he desires, as he imagines, as he sees.” The vision of the artist, to paint “as he sees,” depends on the purification of all the other powers of his soul. Café Cetinje, oil on canvas, c. 1931, 30 x 25 in. Self-portrait, oil on hardboard, c. 1960, 18 x 15 in. The role of the artist in this struggle, however, is not principally on the moral level, as it is with the saint. Not that the artist himself is not called to virtue, indeed to sainthood. It is only that his witness, unlike that of the saint, lies in the realm of the symbol. 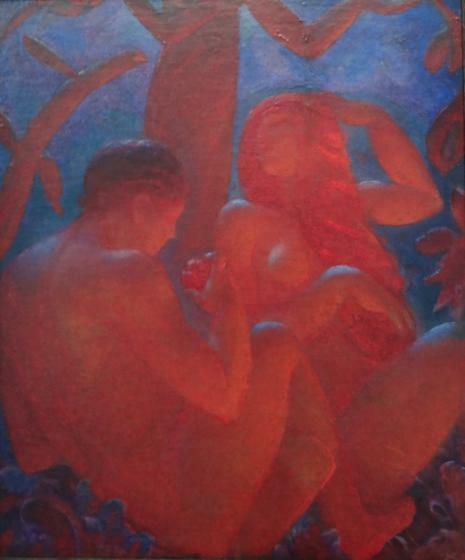 Adam and Eve, oil on board, c. 1931, 38½ x 33¼ in. God, the Devil and Beauty. I remember and hope for such a world. . . .
Woman Reclining, oil on canvas, 20 x 24 in. Study for Reclining Woman, pastel on paper, 13 x 16 in. Within a “proportioned life,” mysticism holds a crucial place in maintaining the balance among these different elements, or rather in fusing the elements in a balanced whole. As Schmitt explains: “Man cannot live by activity alone. But wed or balance activity with desire and activity becomes virtue (industry). And balance activity with inactivity and activity becomes beauty (melody).” The “activity” of art, its creation in physical matter, must be balanced by “inactivity,” by the “desire” of the artist to see things as a mystic, in their deepest reality. Only then is he able to transform his art into the melody of beauty. Chestnut Tree, pastel on paper, 17 x 14 in. True mysticism is itself a balance: between the individual and the social, between the personal experience of God and the understanding of God built up through the tradition of the Church. We will explore the intimate connection between this balance and art in upcoming posts. Eggs and Copper, oil on hardboard, 12 x 15 in. 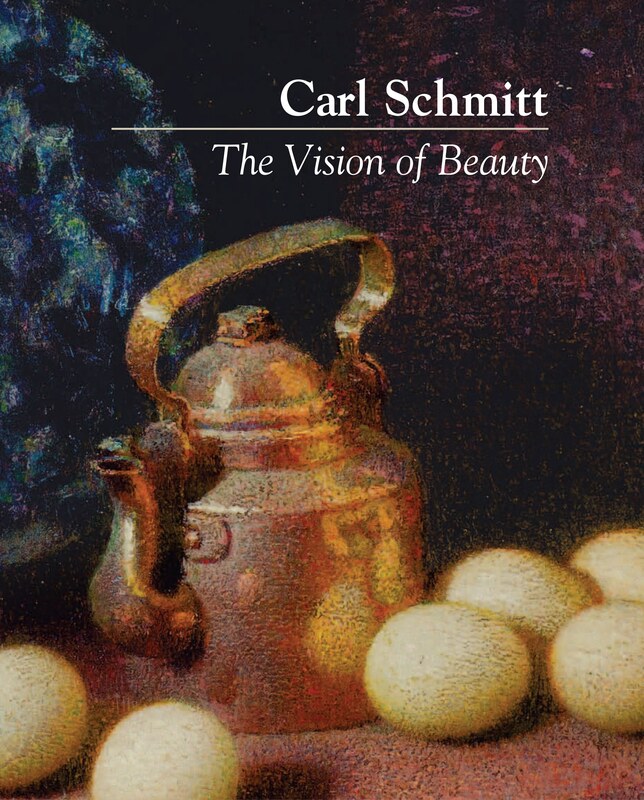 Seeing this parallel between religious mysticism and aesthetic mysticism, Schmitt made an intensive study of the former as the basis for his thought on the latter. The path taken by the religious mystics, one based on what Schmitt called the “mystical virtues” of poverty, purity, and humility, finds a close correspondence in the journey of the artist along the path to full aesthetic vision. From seeing merely the appearances of things (what he called the “lyric” stage), the artist must move on to beholding them in time and space (the “epic”), all the way to the perception of their full reality, their form (the “dramatic” vision). Tagliacozzo, pen and ink on paper, 1939, 20 x 15 in., signed “Carl Schmitt”, lower right. Schmitt stayed in this town in the Abruzzo region of central Italy while recovering from tuberculosis in the late 1930s, capturing its beauty in a series of memorable drawings and paintings. We have seen that this development must be complemented by the maturation of the artist himself, in his capacity to “see” more and more deeply into the things he depicted in his art. Schmitt called this full development “personality,” the “potential of form.” In the coming weeks we will trace this development, which, as we have written in previous posts, is based upon Schmitt’s own account of the “three realities of the imagination,” the lyric, epic, and dramatic. As with all of Schmitt’s thought, the material and the spiritual, the senses and the soul, sight and vision, art and religion, while not interchangeable, closely parallel each other and must be understood together if one is to grasp the full truth of things.